This Saturday, April 13th, a team of University Wisconsin-Eau Claire Entrepreneur Students will be presenting their idea, Li-Fly, at the Wisconsin Big Idea Tournament for a chance at $25,000 and an opportunity to compete internationally. Pictured above, from left to right, are Zach Jocelyn, Ben Durkin, Cole Caldwell, Austin Perkins, and Kristine Maurina. 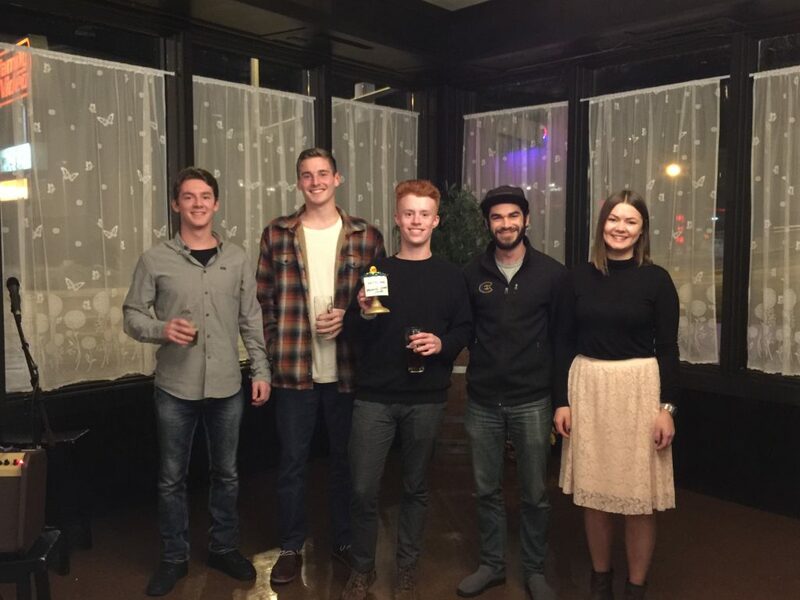 These five individuals, all current students at the University of Wisconsin-Eau Claire, attended Startup 48 in 2018 and qualified for the opportunity to present their idea at WBIT. Li-Fly uses unmanned aerial systems to professionally acquire, manage, and professionally deliver data for farmers. This idea was pitched and worked on throughout the last Startup 48 event – an annual event in Eau Claire, WI that gives individuals hands-on experience on what it takes to run a startup business and connects them to community resources. Hosted over a weekend, individuals arrive to Startup 48 on a Friday evening where they have the opportunity to pitch ideas and vote on their favorites. Once teams are organically formed around the top voted ideas, the teams have only 48 hours to take the idea and make a Minimal Viable Product to present to a panel of judges Sunday night. Since 2015, Startup 48 has held annual events to accelerate the startup community one weekend at a time! “Startup 48 is an amazing program that helps connect dedicated people to one another – it gave us the tools and guidance we needed to succeed!” stated Cole Caldwell, University of Wisconsin-Eau Claire student and 2018 attendee of Startup 48. Startup 48 is Eau Claire’s unique, weekend-long entrepreneurial event that has been called “the most fun you can legally have in 48 hours”. This program is ran through the Eau Claire Area Economic Development Corporation and organized by a dedicated team of volunteers that includes the University of Wisconsin-Eau Claire, the Eau Claire Area EDC, Chippewa Valley Developers Group, and community entrepreneurs. Every year inspiring entrepreneurs or individuals who just want to learn what it takes to be in a startup throughout the region attend Startup 48 over a weekend in October. Starting in 2018, Startup 48 also serves as a regional qualifying event for the Wisconsin Big Idea Tournament (WBIT). The Wisconsin Big Idea Tournament WBIT teaches cutting-edge Lean Startup business development tools, provides business mentorship, and allows participants to compete at a state level for a chance to win seed funding for their idea as well as a chance to compete internationally at the International Business Model Competition (IBMC). WBIT is an entrepreneurship competition open to undergraduate and graduate students attending any two- or four-year University of Wisconsin school across the state (except UW-Madison). The opportunity for Startup 48 to be the qualifying event for the WBIT is thanks to a generous sponsorship through WiSys. WiSys was established in 2000 as an independent, nonprofit supporting organization for the UW System to support the creation and transfer of innovations from the University of Wisconsin System to the marketplace. WiSys works hand-in-hand with inventors, researchers and students to facilitate cutting-edge research programs, identify, protect, develop and commercialize discoveries emanating from the research base as well as foster a spirit of innovative and entrepreneurial thinking on the campuses it serves. To learn more about WiSys, visit them online at https://www.wisys.org/.